I think it's important for members of any core parkrun team to have an intimate knowledge of how to perform all of the volunteering roles required to stage a parkrun event, and as I had decided to give my knee some proper recover time I wanted to use the break as an opportunity to plug my volunteering knowledge gaps. The first of these gaps was timekeeping. Now you'd think I would have done this plenty of times before and be quite fluent in it. 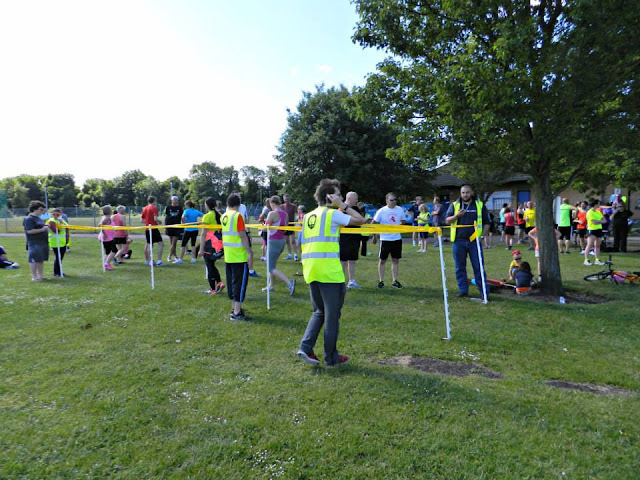 While I had been the half-way timer at Riddlesdown parkrun in the past, I had never actually performed the role at the finish line [blog7t: Riddlesdown parkrun 58 - my first halfway timer experience]. The honest truth is that out of all of the volunteering roles, this one scared me the most and as a result I had always avoided it. The timekeeper is responsible for recording the times of all finishers. This can be a high pressure role, particularly at our busier events. For every runner that crosses the finish line on their own two feet, the timer will record that time using a timing device. This data is then combined with the data from the Barcode Scanners. Our events are provided with multiple timers, so there will normally be someone operating a backup timer. So with it being time to banish those fears, I put name on the roster as timekeeper and I was happy to see that one of our seasoned regular timekeepers, Harley, was down for his fifth occasion in this role. As it says in the description above, timing duties are normally performed by two people. Ultimately, only one set of timing data is used for compiling the results and which one is used depends on how things go for each of the timers on the day. After setting up the course (and chalking some motivational messages onto the route) with Richey and Adam, I got myself suitably refreshed on how to operate our stopwatches. We have the Junsd Professional Stopwatch and it is very simple to operate - you just click the start/stop button when the run director starts the run, then as the runners reach the finish line you simply click the lap button to store each individual's finishing time. You can see the total number of 'lap times' (aka finishers) at the stop of the screen - it can store 500 lap times. During the process I was aware that I could hear Harley's stopwatch beeping every time a runner crossed the line and it was difficult to distinguish his from my own. So I decided to use a stopwatch-at-the-ear-like-a-phone method which overcame the issue of not being sure which beep I could hear each time a runner crossed the line. Once all of the runners had had their times recorded I simply stopped the timer and stored the results ready for the results processor (Tessa) to do their magic! I can't put into words how much I enjoyed being part of the finish funnel volunteer crew. 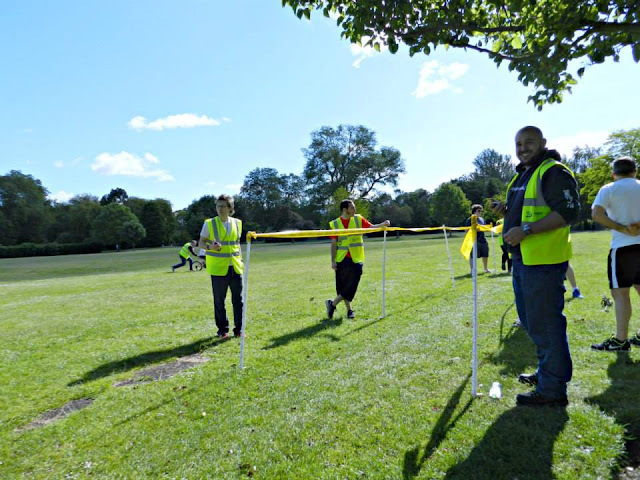 It is certainly one of those areas where I felt very much part of a team, unlike a role like marshalling where I sometimes feel a little isolated at times. The timers communicate very closely with the volunteer handing out tokens (Angela) to make sure that both areas are in sync throughout the event. And the whole thing is overseen by the funnel manager (Adam). All of which I was aware of but it wasn't until I actually did it that I understood everything properly. 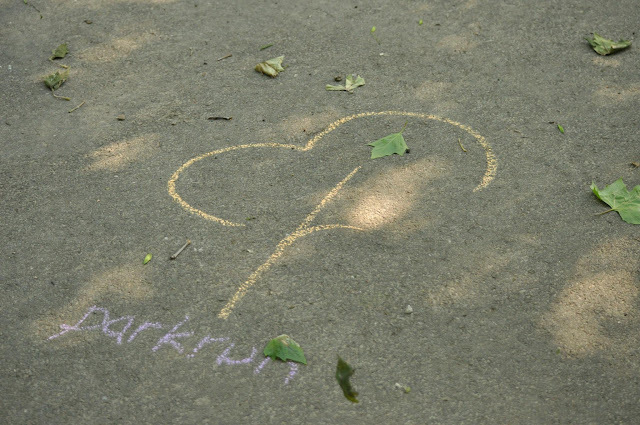 I'm taking off my core volunteer hat here and speaking just as a normal everyday parkrunner. I imagine you've heard it all before, but swapping your run for a bit of volunteering is great and none of the roles are actually that difficult. I'm guilty of always wanting to run and mostly leave these non-running volunteering roles to others while I help out with some of the 'can-also-run' roles. It really is a fantastic experience and I bet if you do it, you'll leave feeling just as satisfied as you do when you run at the event. 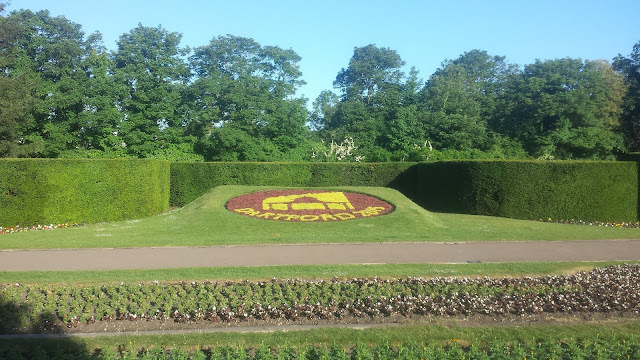 So, to summarise my first experience of being a timekeeper - As long as you can stay focussed on the incoming runners and are able to press a button it's actually really easy and I feel a little embarrassed at having avoided it for so long.